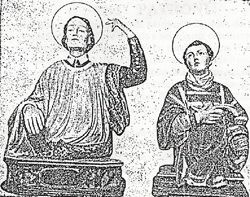 Saints Marian and James were born in the Constantine area (Algeria) around the beginning of the third century. Both were believed to hold religious positions within the church; Marian a Reader and James a Deacon. In 257, during the reign of the Roman Emperor Valerian (253 – 260), all Christian gatherings were banned, the visiting of burial grounds denied and clergy exiled. A year later, the persecution of Christians was made even more merciless by immediately executing all clergy and imprisoning others with chains while expecting them to perform hard labour. Among the many executed were the Bishops Agapius and Secundinus whom St’s Marian & James had once met. St’s Marian & James were eventually arrested and imprisoned for continuing to practice their Christian faith. While in prison, awaiting execution, they had a vision from the Bishops Agapius and Secundinus. They were martyred at either Cirta or Lambesa. Pray for us that we will hold fast to our faith through our words and actions.